Metal Ant Garden Pot Decoration. Ant lying on his stomach on a leaf reading a book. 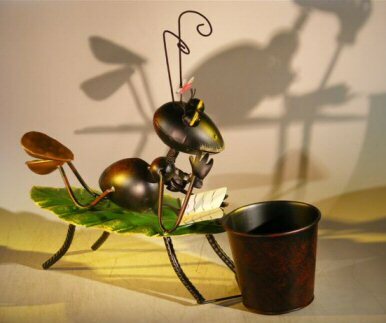 Metal ant garden pot decoration. With movable head and attached pot holder. Measures: 16.0" x 5.0" x 14.0" tall; pot holder measures 4.0" x 4.0".